STM’s state-of-the-art MEMS accelerometers include analog and digital sensors featuring up to ±400g acceleration full scale and from 1.71 to 3.6 V supply voltage. Accelerometers have advanced power-saving features that make them the ideal choice for ultra-low-power applications. These features include low-power mode, auto wake-up function and FIFO buffer that can be used to store data, thus reducing the host processor loading and system power consumption. STM’s portfolio also includes accelerometers for automotive applications, such as the AIS32x family, with extended temperature range and AEC-Q100 qualified, and IISxxx products, that are part of STM’s longevity program and will stay in production for ten years from the date of introduction. The general purpose evaluation boards are here. On this board there are the sensors listed below. 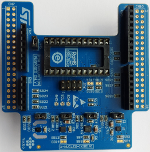 If you need test the MP45DT02 (microphone), LIS302DL (ultra compact low-power three-axis linear accelerometer), in conjuntion to the STM32F407VGT6 (Cortex M4), use STM32F4-Discovery.